Welcome to Red and Black Buffalo Plaid Project #2! 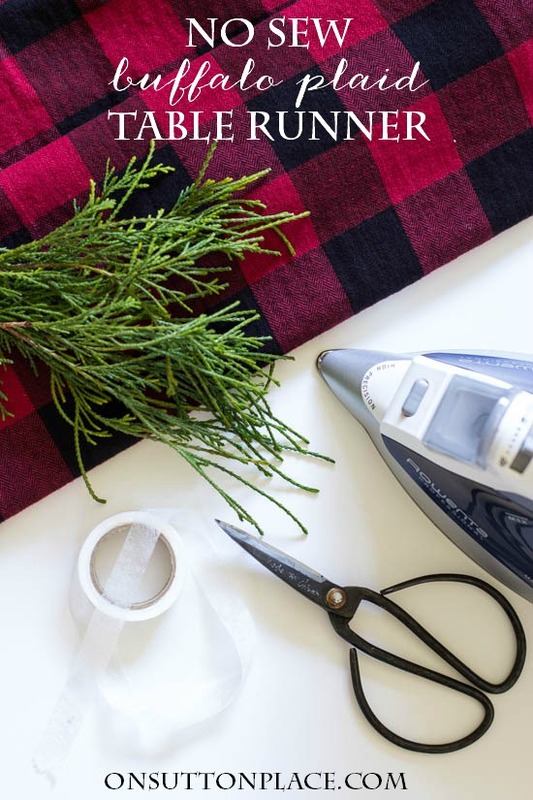 Up today is a simple, no sew table runner. 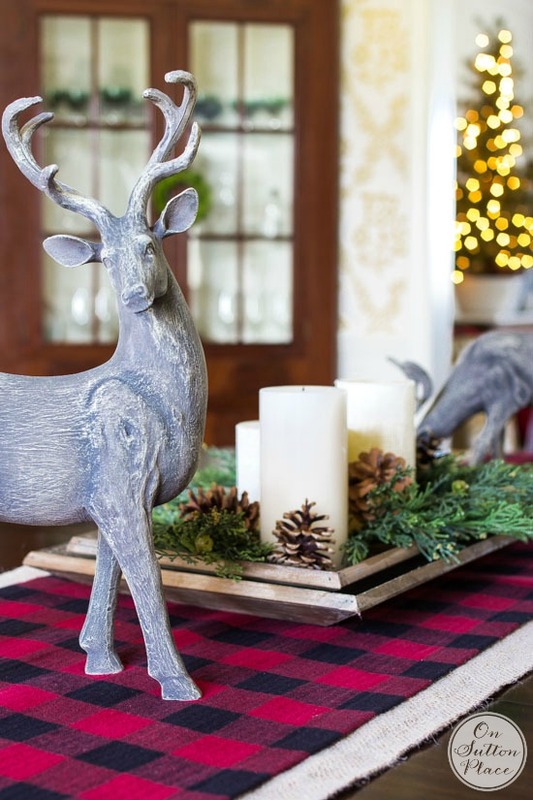 Of course you can make this with any kind of fabric under the sun…but the flannel will give your table a cozy, Christmasy feeling. Flannel comes in all sorts of plaid patterns and here’s the best part…the colors are woven in so if you cut on a pattern line, your cut will be straight. Can’t get much easier than that! To figure your table runner length, take your table length measurement and add 14 – 16 inches. That will allow for a 7 to 8 inch drop on each end. The width can be anywhere from 15 inches to 24 inches depending on the width of your table. On your ironing board, turn the edge of one long side over about 1/2 inch. Press as you go. Turn the same edge over again about 1/2 inch. Now you will have a finished long edge. To secure the hem, open the second fold up and lay fusible tape along the entire side. Close the fold and press well until the tape is activated. Repeat these steps for the other long side. Pull threads from both short ends to make a fringe. I decided to leave the short ends raw with a little fringe. I didn’t realize that flannel could be fringed until I washed the whole piece before making my DIY Red Buffalo Plaid Christmas Ornaments. It saved a step and sort of goes with the rustic feel of the buffalo plaid. When my runner was finished and it was time to take pictures, my heart dropped to my feet after I put it on my table. Because the table is so dark, the runner got completely lost and didn’t show up at all. I briefly considered trying to photograph it that way but knew I wouldn’t be happy…and either would you. Like I do many times when I am frustrated with my dark furniture, I decided to lighten things up with an extra layer. I grabbed my Burlap Table Runner with Tassels, placed it under the buffalo plaid runner and the problem was solved. 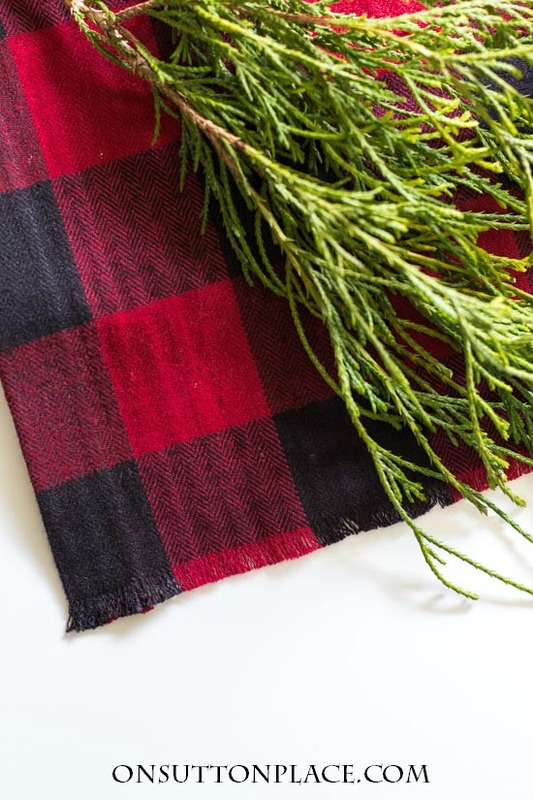 If you have a light table, the red and black buffalo plaid should look magnificent without any help from burlap. I made the centerpiece in literally five minutes. 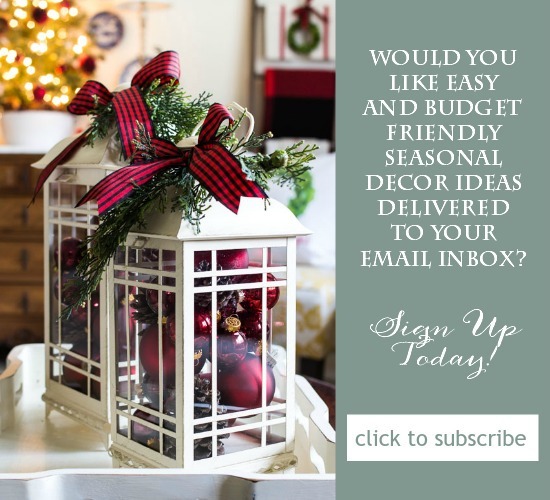 For more inspiration on that take a look at my eBay guide, 5 Minute Centerpiece Ideas. I seriously considered tying buffalo plaid ribbon around their necks but just couldn’t bring myself to do it. They are so stately and serious that I thought they might look a little ridiculous! Are you a member of the OSP Family? We’d love to have you join us? I found some bird burlap at Joann’s. It wasn’t exactly the same, but very close! Love buffalo plaid! Great trick placing it over the burlap runner to make it stand out. I have the same problem, so that is a good solution. TAGS…PLUS TWO OF THE CHALKBOARD PRINTABLES. THANK YOU ANN AND MERRY CHRISTMAS???????? Very nice, Ann. Looking forward to seeing more! Thank you for the very simple and precise tutorial. 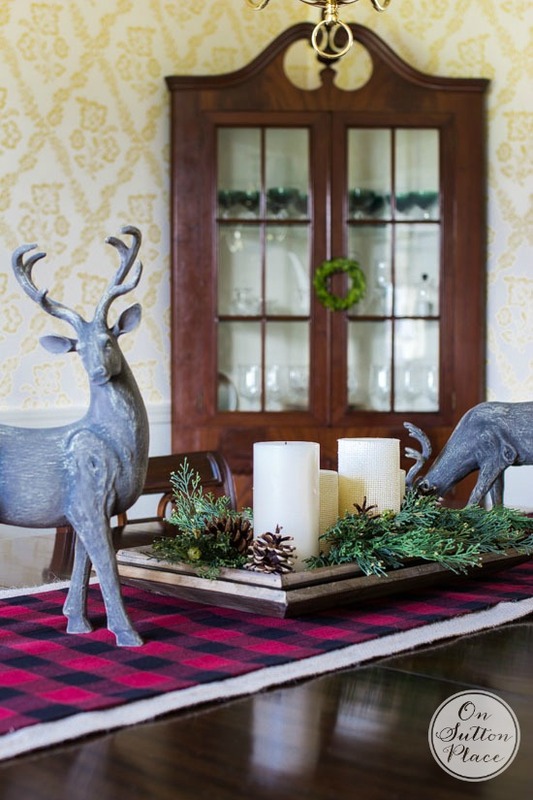 I just love buffalo plaid, I think it is so warm and welcoming, and when Christmas is over most of the buffalo plaid can stay out until spring. 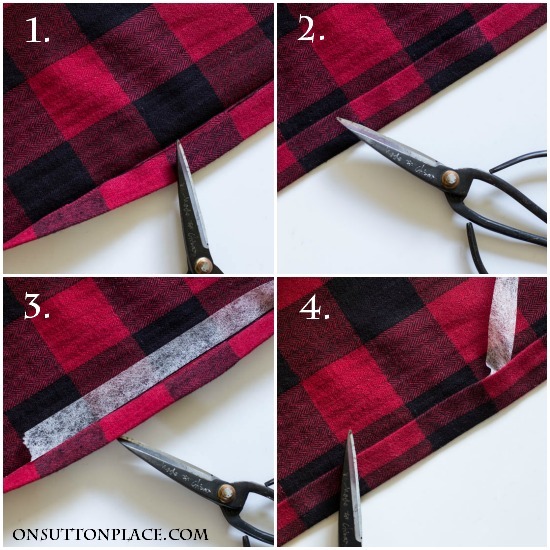 I am going to buy my buffalo plaid material and get started making the table runner. I have really been getting seriously tired of my Christmas decor and have been wanting to cut back and simplify, you have really helped me with so much, I used my same o, same o this year, but I have already started making pillows and ornaments for next year and I got a bargain on some really good ribbon. I appreciate your tutorials so much and your talent, you have no idea how much you help someone like myself with limited skills and talent. I Wish You and Your Family a Very Merry Christmas and a Happy New Year. I love the table runner and your centerpiece. You really brightened my day. Thank- you for all of your beautiful ideas. Love your understated and homey table decor.. Such beauty in simplicity! I love buffalo plaid and your projects so far. 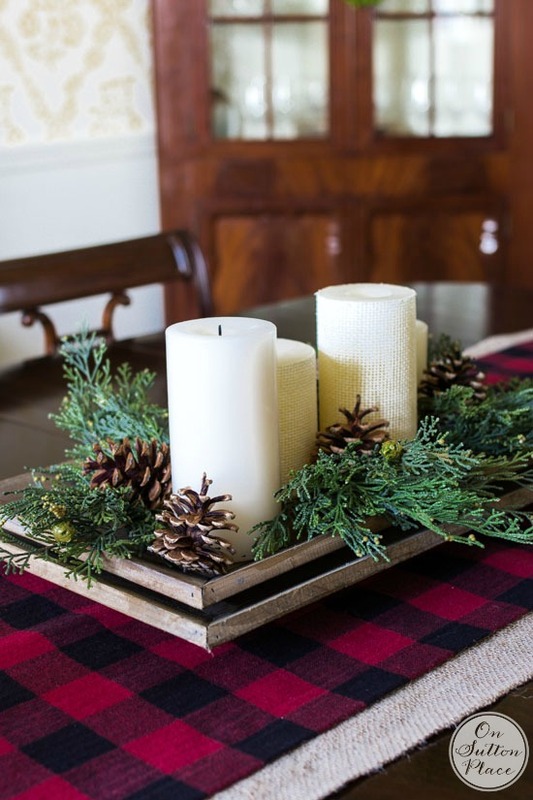 The table runner is lovely and the burlap under layer just adds to the rustic look. Can’t wait to see the rest of your Christmas decorations. I love it Ann! That was brilliant putting the burlap runner under it as well. I like the layering look. So beautiful and yet so simple! I too have a dark dining room table and I never thought of layering another runner underneath – brilliant! 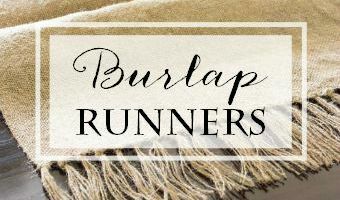 Question – Did you wash your burlap before making the runner? Just wondering as it often has a wonky smell and can be stiff. I love how everything is coming together for Christmas!